If Oliver Twist teaches us anything it’s that over worked Victorian orphans are greedy ungrateful little gits who would pick your pocket quicker than you can say ‘What the Dickens?’. It does also demonstrate that despite their apparent starvation they have an extensive knowledge of fine foods and cooking methods. Resultantly I imagine that they would rather enjoy this stylish little bolthole. The Fellow is handily parked just down the side of Kings Cross station and is alone in the immediate locale as being a pub which ticks pretty much all the major boxes. 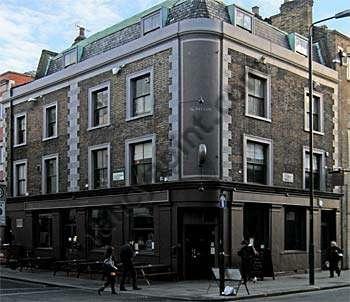 There are some cracking pubs just a stones throw away (The Euston Tap, The Crown Tavern) but if you want to avoid a getting on a tube or want some grub then The Fellow is exactly what you want. Though decorated in a modern style this still manages to feel homey and warm the way a good pub should. The downstairs bar is divided up well to provide both space for a larger group or intimacy for romantic nonsense/clandestine discussion of nefarious deeds. Heading upstairs you’ll find a smaller cocktail bar and more excitingly a very attractive beer garden nesting between the surrounding buildings. Really though the highlight of The Fellow has got to be the menu; for what is essentially central London it isn’t too expensive and the standard is breathtakingly high. If I hadn’t accompanied my nosh with several pints of Doom Bar I’d almost certainly have been holding my plate up to the waitress with a doe eyed expression and whimpering for ‘more’. You’d be missing out if you didn’t make a point of eating here and it’s worth booking ahead as my companions and I were lucky to get seated relatively early on a Thursday. Even if you’re not going to stuff your face this is still a solid option for a couple of pints. Though the beer selection isn’t extensive and the bar prices are leaning a tad towards the expensive end of the spectrum (two pints = scant change from a tenner) it consistently has a good atmosphere and a warm welcome. Just like the cheerful tale of Oliver Twist your visit is likely to have a happy ending (if you ignore the murder, lynching and execution…in Oliver Twist not the pub…for pubs with murders see The Blind Beggar).